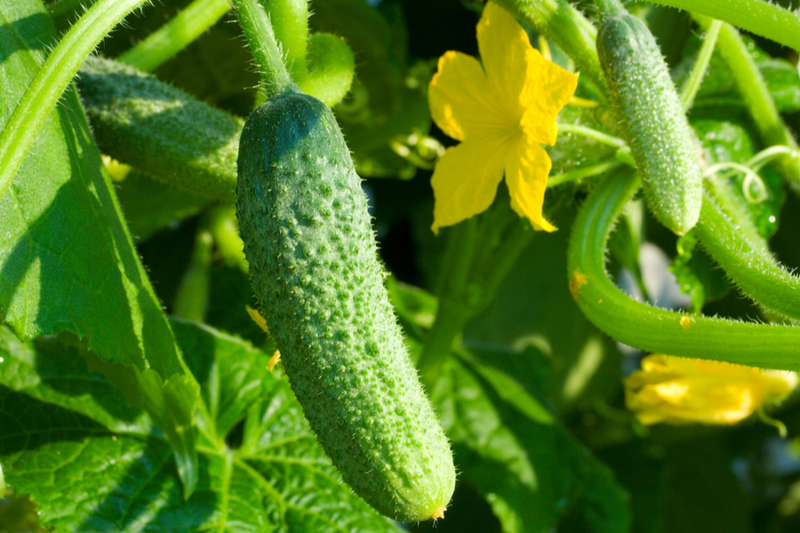 6 Great Cucumber Varieties To Grow For Fresh Eating or Pickling! Looking for some great cucumber varieties to grow in the garden this year?We have you covered with today’s article! And whether you are growing for fresh eating, or for making delicious pickles, there is sure to be a variety or two that will fit the bill. Cucumbers are one of the tastiest crops a gardener can grow. And one of the most popular to grow in the home garden. For starters, home-grown cucumbers are always sure to be crisp and fresh. And that is important for eating, and for making pickles! But of more importance, commercially grown cucumbers can be covered in pesticides. In fact, they are one of the most highly-sprayed pesticide crops of all. So if you are looking to eat with an organic touch, growing your own is the way to go. There are basically two main varieties and two growing styles of cucumbers. There are two basic varieties of cucumbers – slicing and pickling. Pickling and slicing cucumbers are the two varieties. While bush and climbing or vining are the two styles. Pickling cukes tend to be smaller and have a smaller seed core. As the name implies, they the perfect choice for making pickles. Slicing cucumbers tend to be larger and longer. They are the best choice when it comes to salads and fresh eating. Bush varieties of slicing or pickling cucumbers tend to stay more compact. Vining varieties, on the other hand, will grow on long vines. Making pickles! One of the advantages of growing cucumbers. Vining varieties can be trained onto a trellis or fence, or left to sprawl on the ground. So what are the best cucumber varieties to select? It all depends of course on what you want to grow them for – pickles, or fresh eating. We have included 3 of each type below. Along with each variety, we have included a seed link. The Boston Pickling Cucumber is a seedless variety with outstanding flavor. It has origins that date back to the late 1800’s in Boston. This heirloom variety remains a pickle-making favorite today. The smooth-skinned cukes grow to about 3″ in length when mature. It produces mature cucumbers in as little as 50 to 55 days. It continues flowering and bearing as long as the cucumbers are picked. This Bush Pickle Cucumber is a good choice, especially if you are short on space. Plants stay small and compact, usually around 24 to 36 inches in height. They even grow well in containers, making them perfect for the patio. The Bush Pickle cucumber is sweet, with a smooth outer skin. Fruits range between 3 to 5 inches long. It matures in about 50 to 55 days in normal growing conditions. Not as well known as the Boston or the Bush pickling variety, the Wisconsin SMR cucumber is nonetheless a great choice for pickle makers. It is a highly productive plant. Cukes grow to about 6″ inches in length, with a 2″ to 2 1/2″ inch diameter. It also produces early, maturing at about the 50 day mark. The Wisconsin is a great choice for those wanting to make dill picklets. The Straight Eight cucumber is a sweet, tender and delicious slicing cucumber. The Straight Eight contains a small seed cavity, making it perfect for eating or for salads. And does it ever produce! Fruits tend to be 6 to 8 inches long with a dark green skin. They mature around 55 to 60 days. If you want a slicing and eating tomato that is a conversation starter, this is it! The lemon cucumber produces mature yellow cukes. And adding to their oddity – they are round, not oblong! They take on an almost lemon-like appearance. This vining cucumber is sweet, tender and delicious. It makes a wonderful cucumber for salads, or to simply slice and eat. It has a longer maturation period than most at 65 days. The Diva hybrid cucumber is a big winner for taste – and a big producer! The Diva Hybrid produces a high quantity of 6 to 8 inch long cucumbers. These dark-skinned cucumbers are meaty and tasty. The Diva matures in just under 60 days, and has good resistance to many of the more common cucumber diseases. To grow best, cucumbers should be located in a sunny area. They need rich, fertile and well-drained soil. Adding generous amounts of compost when planting is a big key to helping your plants thrive. Mulch plants early on to control fluctuations in the soil temperature. Plant seeds directly into the soil a few weeks before your last frost. If you live in an area with a short growing season, you can start cucumbers indoors a few weeks before planting. August 22, 2018 TIMG Comments Off on How To Stop Ants Naturally – 3 Great Methods For Outdoor Control! May 17, 2017 ThisIsMyGarden Comments Off on Creating Gorgeous Hanging Baskets and Containers – From Ornamental Peppers!